Beth & Cory's Mom: Soon He'll be TWO! Jason will be two in less than two months. How in the world did that happen? It seems just yesterday he was born, a brand-new baby boy. And then just as quick as that we were celebrating his 1st birthday party. Since he's a little monkey, his mommy used a monkey theme for that party. There was even a banana cake! My poor kids were very deprived and never actually had birthday parties, except for Beth's 6th birthday. We didn't have any fancy themed party - just a homemade 'carnival' in a tent in the backyard. I don't know that she would have been a Disney Princess kind of girl anyway... We did usually go to Olive Garden, have a family dinner, and get the wait staff to bring out a cake and sing for the birthday kid. Jason got that, too. 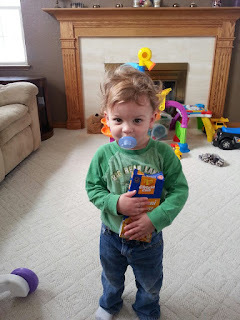 I wonder what kind of party this little cutie pie would like for his second birthday? I mean, if he's gonna insist on growing up and turning two.